"This is a slightly modified version of a popular Middle Eastern breakfast dish. I love this recipe because it is easy, healthy, and satisfying. You can also make this with fresh tomato and jalapeno, but I like to use the canned version so I can make it whenever I want with ingredients from my pantry." Heat the vegetable oil in a deep skillet over medium heat. Stir in the garlic, onion, and bell pepper; cook and stir until the onion has softened and turned translucent, about 5 minutes. Add the canned tomatoes, paprika and jalapenos; stir, using the back of a spoon to break up the tomatoes. Simmer for about 25 minutes. Crack an egg into a small bowl, then gently slip the egg into the tomato sauce. Repeat with the remaining eggs. Cook the eggs until the whites are firm and the yolks have thickened but are not hard, 2 1/2 to 3 minutes. If the tomato sauce gets dry, add a few tablespoons of water. 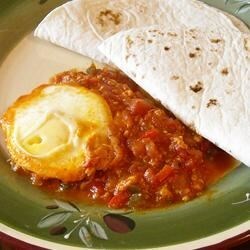 Remove the eggs with a slotted spoon, place onto a warm plate, and serve with the tomato sauce and pita bread. Eggs gently poached in a robust tomato-pepper sauce. The tomato base can be made ahead of time (it actually is better the longer it sits so it is great if you have leftovers). The next morning I reheat the mixture and add the eggs. This is a variation of a very old Italian dish my Grandmother made. Of course, she used left over pasta sauce from Sundays dinner & served it with crunchy italian bread toast!